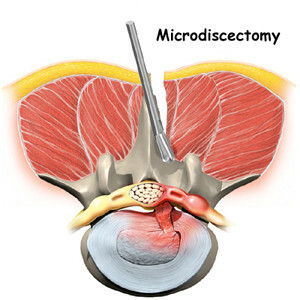 In a microdiscectomy disc material from under the nerve root is removed to relieve neural impingement and provide more room for the nerve to heal. 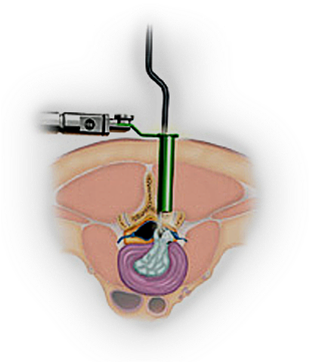 A microdiscectomy is performed through a small (1 inch to 1 1/2 inch) incision in the midline of the low back. First, the back muscles (erector spinae) are lifted off the bony arch (lamina) of the spine. Since these back muscles run vertically, they can be moved out of the way rather than cut. The surgeon is then able to enter the spine by removing a membrane over the nerve roots (ligamentum flavum), and uses either operating glasses (loupes) or an operating microscope to visualize the nerve root. The nerve root is then gently moved to the side and the disc material is removed from under the nerve root. Importantly, since almost all of the joints, ligaments and muscles are left intact, a microdiscectomy does not change the mechanical structure of the patient’s lower spine (lumbar spine).